Thank You Houston Dynamo! 5/19/2013 | Travis the Warrior --- Kickin' Cancer! We want to thank each and every one of you from the bottom of our hearts for all that you did for Travis and our family in creating such a special day. From being greeted at the door by Stephanie and being introduced to Chris, Stephen and Eddie, to meeting Melissa from the Dynamo Girls, to watching the team warm up and watching the game from the field level seats, to meeting most of the players after the game and some of the families (David, Lisa and Taylor; Tally, Ericka and their kids), to having the players autograph Travis’ Dynamo ball and finally for being able to watch some great soccer. We couldn’t have imagined anything more perfect and it is still hard to believe that it all happened. Thanks so much Houston Dynamo for the first class treatment especially from Stephanie, Chris, Stephen, Eddie, David, all the players, the Dynamo Girls and everyone with the club. You were all so welcoming and really made Travis feel like a rock star! Thanks also to Mike Chabala, Tally and Ericka Hall for spending a few extra minutes with us. It was nice to have that California connection. We truly appreciate everyone making our family feel so special and putting a huge smile on Travis’ face. 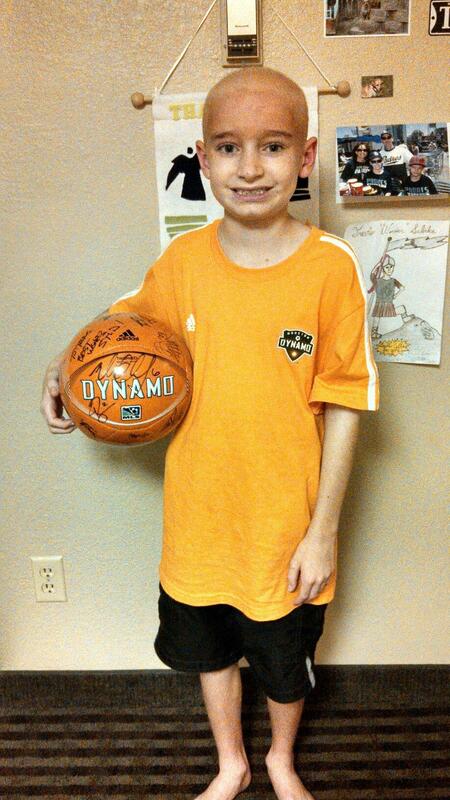 He can’t wait to get back on the field to play soccer and this experience gave him some extra special motivation. Good luck this season and we will be sure to continue following the team when we return home to California in about a week. Go Dynamo!